High-grade industrial polypropylene plastic drywall tools. Economical, for single-use or long term use. DAP Wall Repair Patch Kit featuring DRYDex Dry Time Indicator Spackling comes with all of the tools needed to complete a wall-patching project. This kit may be used to repair holes up to 4 inches in diameter in drywall or plaster surfaces. DRYDex Spackling provides a unique dry-time indicator that verifies when the patched surface is ready to be sanded and painted. - Tools included - 1 237mL tub of DRYDex Spackling, 1 - 5 inch x 5 inch Fiber Tough patch, 1- 4 inch x 3 inch 100 grit sand paper, 1- 2 inch ergonomic plastic putty knife. Ergonomically designed handle reduces muscle fatigue. Rubberized handle is easy to clean and solvent resistant. High carbon steel blade patches small holes and cracks. 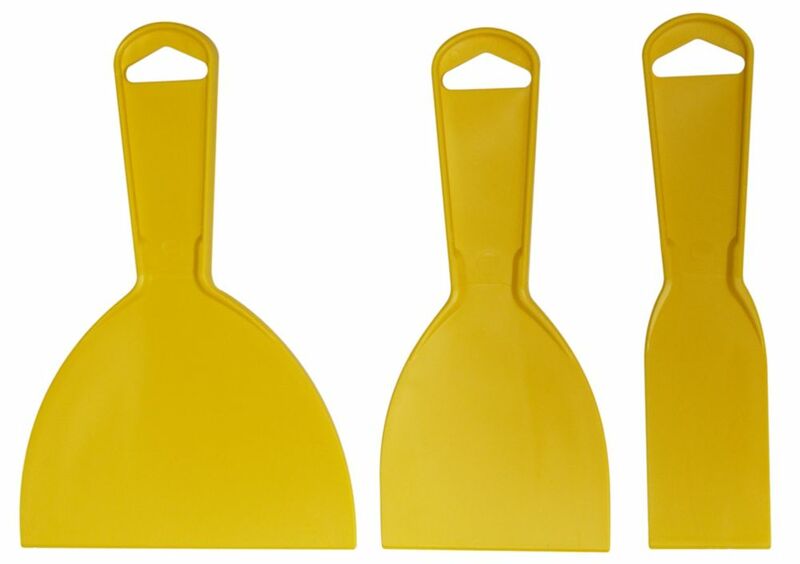 Plastic Set 3 Putty Knives High-grade industrial polypropylene plastic drywall tools. Economical, for single-use or long term use.